We provide a services platform designed for companies who want to build a SIP trunking practice & a recurring revenue stream. 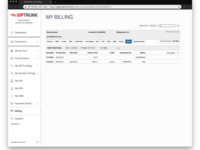 The software platform that powers SIPTRUNK was designed to make life painless for resellers. You can deploy solutions for your customers in minutes and have the confidence that you are offering a high-performance, reliable solution that you'll be proud to stand behind. Cons: I do not like like the way number i own are listed. I have 100s of numbers i wish there was a better system for finding them. I wish siptrunks supported t38. When there is a problem I wish they had voice line to call and talk to someone. Overall: I have had a overall great experience with siptrunks. The people have worked with me to grow my sip trunking with them. The website is easy to use and helps me get done with what I need in fast and timely way. I imagine i will be working with them for the foreseeable future. Pros: This companies systems are great in the sense they have an almost real time provisioning system that's automated. They also have overall good support. They have created redundant SIP peers which allows for more uptime. Cons: They are not the cheapest sip provider out there, however their reliability out weights the cost. My biggest compliant is they use bandwidth.com for their back end carrier and there doesn't seem to be a way to choose a different CLEC. Overall: We've been using them for three years with great support and service. Pros: I love Siptrunk.com, they have wonderful documentation to set up your SIP trunks. They also hands down have the best tech support out there. It is refreshing to be a Partner with a Company that wants to be a team with you. Alot of times when you Partner with a company you feel like you are all on your own. Overall: Being able to set up a customer, and have them up and running the same day. Saving time on trying to get someone to help you if there is a problem, SIPTRUNK.COM is always there for you. Pros: It works and is pretty painless to setup. Years of quality service and no downtime. Cons: Other SIP providers can get fax to work, not this one. Lag on DNS queries, alternate servers in other locations would be nice so that we could streamline the route. Overall: Easy to tie offices together and to quickly setup hosts for services and make changes to the plans. SIPTrunk great service & excellent support! 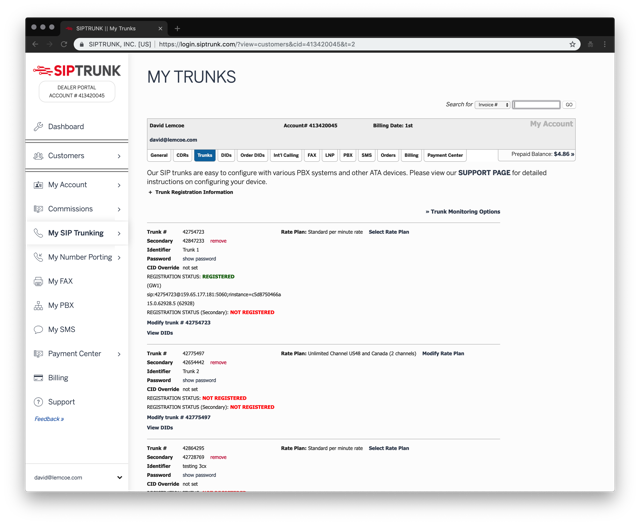 Cons: Everything works great - we have a couple of hardware incompatibility issues which SIPTrunk helped us identify and resolve quickly and/or workaround. Overall: Many installs - couple of technical issues (100% on our end) SIPTrunk support has helped us through resolving these issuer quickly. Great support! Pros: The ability to manage all of your SIP trunking needs through a well designed self-service portal. No more phone calls or waiting days to have simple changes made. Updates are realtime through the portal. Cons: No telephone support. They are responsive to emails, but sometimes you just want to be able to call someone. Cons: The inability of being able to allow more than one login per account. Overall: Have had very, very few issues and those that I did have were resolved within acceptable times. I especially appreciate being able to call where others will only accept tickets. Pros: Great service and customer service/support is great, too! Cons: They're a little more expensive than other SIP trunk providers, especially when it comes to toll free minutes. Overall: Overall we're very happy with SIP Trunk. It's easy and fast and reliable, just a tad expensive compared to other providers. Cons: Fax-to-email service needs to accept multiple senders. 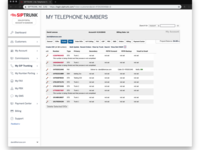 Overall: SIPTRUNK.com has been an instrumental partner in deploying VoIP services to our clients. We will have a successful relations for many years to come. Thanks for all the support! Pros: I have used SIPTRUNK for several years now and their service is extremely reliable and flexible. Customer Support is outstanding as well. Cons: The only minor issue, that was corrected, is correction in billing after a number port. There required one adjustment over their standard service offerings. Overall: I have 3 deployments of SIP trunks to 3 of my customers and have had 0 issues in over 18 months of service. Pros: Very easy to order and set up. They give you very clear instructions and excellent support. Need to add another channel? Super easy. Even as an affiliate I can easily login and help my customers. they send alerts each month of how many times you've maxed out your channels so you can adjust accordingly. Cons: Billing is a little weird. They charge at the first of each month but when you want to add additional channels in the middle of the month it gets kind of confusing as far as building goes. But that's easy to overlook. Pros: Well, it's not a software. It is a service. With that said what I like most about the service is how easy it is to set up with our 3CX systems. Cons: There is really nothing I can say here. The website does the job, but feels a little dated. But with that said the site is function over form, which I prefer. You can have the most beautiful site in the world but if it does not function, it is useless. Overall: It is very easy to work with SIP Trunk. One of the customer rep is always very responsive to my questions and makes my life easier on setting up customers on SIP Trunk. Pros: Most stable SIP trunking I have used so far. Support is quick and helpful and automated alerts are useful. I also like the fact that they give you a primary and a failover trunk to utilize. It's also great that they are 3CX approved. Cons: Faxing services are little expensive. Not a big deal if you dont send/receive a lot of faxes. Pros: Easy to use. No issues in setup. The support was great. Cons: I did not have any cons about the software. Overall: Is easy to use and manage. Easy setup. Great to reduce costs. Very flexible. Pros: - Simple white-label SIP services. Cons: None. I can't say I have had a single issue using and selling this service. Overall: I have had zero issues reselling phone service with SIPRUNK.com, and their technical support team has taught me everything I need to know when it comes to setting up customers. 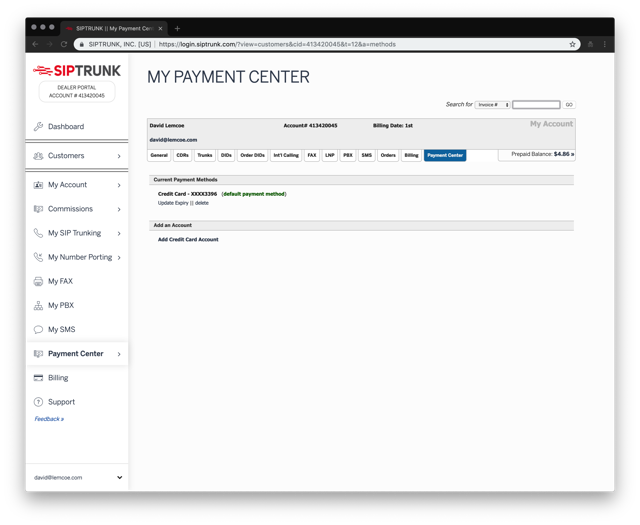 Pros: The advantage of SIPTrunk is the ease at which you can setup an account and be online in just minutes. Cons: When a customer goes over their monthly allotment of minutes they don't roll over into the next higher tier plan automatically so the account has to be constantly monitored and then the plan changed manually. Pros: Once the Trunk was configured to my PBX, it was hassle free and almost ran itself. Cons: Not I an think of when it comes to the cons of the software. Pros: As as siptrunk dealer, I am pleased with the sales and support staff. I cant site a time when there was a problem with my siptrunk service. 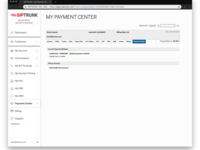 Overall: Siptrunk has been a great service to use with our commercial kiosks. 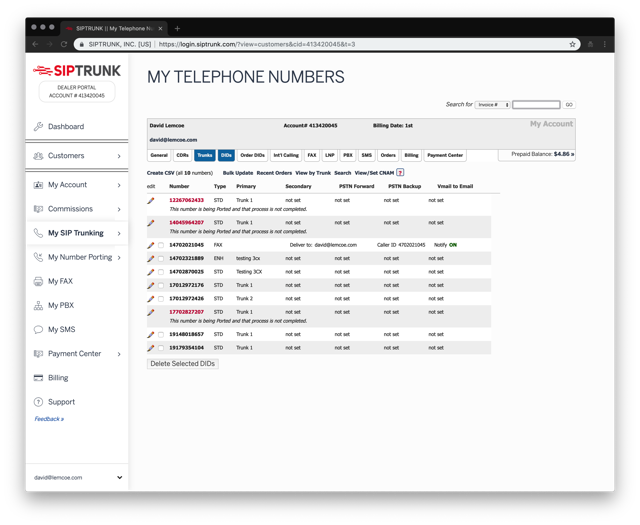 Siptrunk has been a great service to use for hardware such as 3CX or Cisco voip gear. Pros: Siptrunk is a great value with fantastic setvice. In over a year, my clients have not experienced an outage and have had no complaints related to the service. I highly recommend. Cons: There is nothing I liked least about the service. They have great customer service which is a rare commodity. Pros: How easy it was to setup and use. Did not have to be a technical person to use it. Pros: Works perfectly, just as advertised. Easy to integrate with a variety of PBX solutions. Cons: Price is a little on the higher side compared to other services but works perfectly. Overall: Siptrunk.com is amazing. Technical support is great and the service just works! Pros: The service is incredible. Always have a fast response and quick resolution. Makes me wish I had more issues! Cons: Too few issues. Not enough opportunities to speak with the great support staff. Overall: Managed services provider with over 100 trunks. Pros: I like the fact that I can choose between a per minute rate at a great price or unlimited also at a great price. It allows for a lot of flexibility to fit what ever the need is. Plus the per minute rate allows for an unlimited amount of calls which is great for high call volume. Their call report is also very useful. We have over 30 DIDs with them that we use for tracking advertisements and it's very easy to pull a report and see how many calls came in from which ads. Plus the DIDs are only a $1 a month once you go over the ones that you get based on your minutes purchased. Great company and service. Cons: I haven't found anything that I don't like about siptrunk.com. Overall: Great service overall. Their product is great and so is their support. Pros: The best thing about siptrunk is their reliable service and superb customer service. Any issues I've had have been quickly resolved within less than a few hours. The ability to add a trunk through freepbx using a plug in makes the service even more valuable. Cons: I like everything about siptrunk - I cant think of a single issue or difficulty. Pros: Thank you for being a great company with awesome customer support. Cons: Not one that I have seen yet and I have been with the company for over a year across 5 offices. Pros: The SIP trunking software is an easy to use software that our entire team uses for communications. The ease of setup, management and pricing makes this a must have for business teams. We highly recommend SIP Trunking. Cons: We love everything so far! Cannot vision us going back to previous high cost provider. Pros: SipTrunk is pretty easy to set up, and has been reliable for my clients. Cons: Would be great if they had a prepaid per-minute option for smaller customers. Pros: Easy to use and setup. Great customer support. Cons: You can not mix unlimited channels and pay by minute. Overall: SipTrunk.com offers a great value and excellent service. Pros: Their service is very easy to use, the pricing is straight forward, service just works very well. Cons: I haven't had any issues with them. I only needed to use tech support for the initial setup and it has worked just fine since then. Overall: We are saving a ton of cash over our POTS lines. Cons: Website isn't mobile friendly, not that its a huge issue. Pros: Quick to setup, ease of use and troubleshooting, partner friendly and a great price. Cons: Can't think of any. These guys built a great platform with exactly the features needed. Overall: Perfect partner for PSTN for new premise or cloud based voice systems. Pros: Cost Savings and ease of use. Another reliable product to add to our stack. Cons: Limited after hours support, Limited user management in portal. Overall: Overall experience with SIP Trunk and their partner program has been good. Pros: Simple to set up with 3CX and good voice quality. Cons: That I didn't use it sooner. Overall: This was solved a reliability issue and also beat out pricing from the local phone company and also other cloud providers. Pros: Ease of setup, affordable pricing and great support. We use mostly for reselling. Cons: The UX seems a little dated, otherwise, love everything. Pros: This was simple to setup. I expected all kinds of hassles and none appeared. When I called support, an engineer answered and my question was answered quickly. That alone is awesome. Please don't change that ever!!! The minutes packages have been well suited to our customer usage and the portal is easy to understand and use. Please don't spend time on redesigning the portal because it's easy, quick and complete for our needs! Thank you. Cons: I don't have any except maybe a nit-pic. Make it just a little easier to get context sensitive help when I'm confused about the page I'm on. Overall: Just easy. The way things should be. Pros: Simple to use interface for order provisioning. Cons: No direct VPN support or ability to bill on be half the clients. Pros: Very easy to setup and get my client's accounts created and the port process is very simple. Customer service is very responsive and helpful with the questions I had. I have already recommended my other clients switch to their straight forward plans. Cons: Nothing so far, I am satisfied with the service. Pros: They are helpful and respond quickly if you ever have any issues or questions. It is an easy to use interface. They also have great guides to help you set up and connect it with PBX vendors. Cons: No cons. I have had only great experiences and would highly recommend. Overall: Using Sip Trunk to connect to 3CX. It connects very easy and works perfect. Pros: Extremely easy, straight forward and fast process. Excellent support during and after transaction. Cons: There is nothing that wasn't liked about this software and experience. Overall: Excellent experience, provides a fast, effective and cost efficient option to provide DIDs. Pros: Everything is it in it's own place. You can find everything quickly and get setup fast. Cons: I don't like the way of transferring money to cover up the monthly charges, it makes the primary DID unavail for a couple hours... Need to be fixed!